Remember The Boys from Baltimore? Here is one of "The Boys"-Mr. Frank Borzymowski crankin' out some great Polish American Polkas! Check out this CD with International Polka Music Hall of Fame® Frank Borzymowski and Friends. There is much great music on this CD and features Frank Borzymowski formerly of the Boys from Baltimore and Rhythm and Sound. 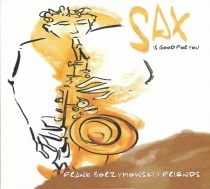 There is a long polka medley on this CD with several guests including: Rich Tokarz, Johnny Karas, Whitey Ryniec, Mike Stapinski, Lenny Gomulka, and Mitch Biskup. Check out this CD today!